Lets start with the bad news first. 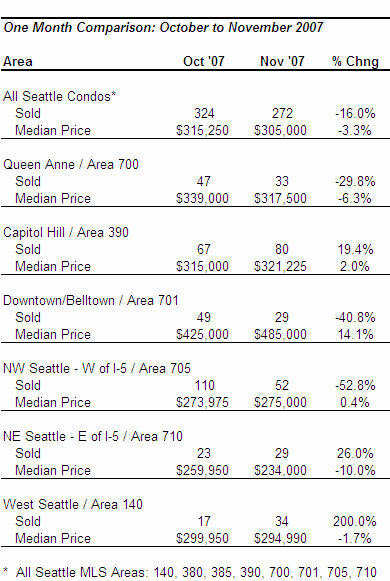 The median price for Seattle condos fell for the third consecutive month; it now stands at $305,000, a 3.3% decrease compared to October. And, as we’d expect with cyclical patterns, fewer condos were sold last month, though pendings transactions remained unchanged. The good news? 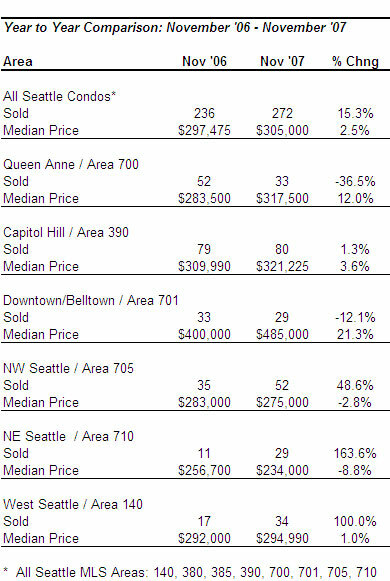 Overall, Seattle’s condo market performed very well in November. While the month over month figures show a downward trend in the median price, compared to a year ago, median price rose 2.5%, the 11th consecutive month that 2007 sale prices have outpaced 2006. 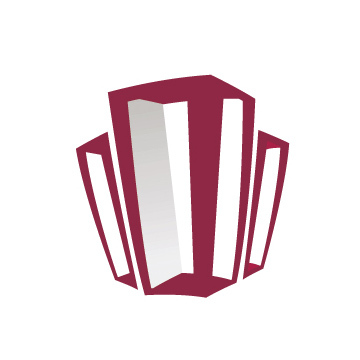 Additionally, the number of closed sales increased 15.3% over the prior year. Buyers are still buying and sellers are still experiencing value appreciation. There was an 11.4% drop in the number of active condo listings last month with the number of listings that went under contract remaining relatively unchanged. 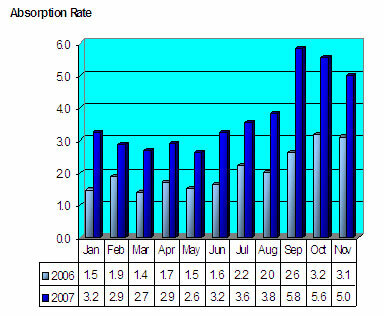 As a result, the absorption rate (inventory level) dropped to 5 months, the lowest level since Summer. 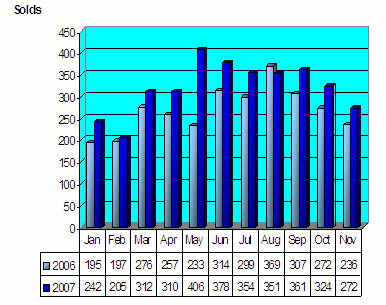 I anticipate the number of actives will drop again in December, then pick up during the first quarter of 2008. 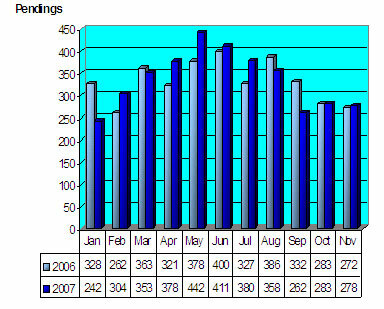 In compiling the information provided in the charts below, I’m strictly using published NWMLS area data. Previously, I manually calculated the data based on narrower neighborhood parameters. Personally, I’m experiencing a surge in business, mostly on the buyer side. 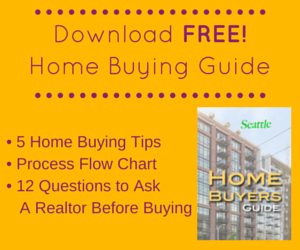 The softer market is encouraging buyers into the market. Sellers are being far more open towards negotiating price and terms, providing some sweet deals for buyers. Sellers will still come out ahead, just not at the levels we’ve become accustomed to over the past few years or even earlier this year. Looking forward, there aren’t any significant projects due to be completed in the first half of next year providing the market time to normalize and absorb the remaining resales from Cosmo, 2200, the Parc and Canal Station. Trio will likely dump resales on the market but it’s a smaller project that hasn’t sold well in pre-sale so it’s unlikely to make much of an impact. 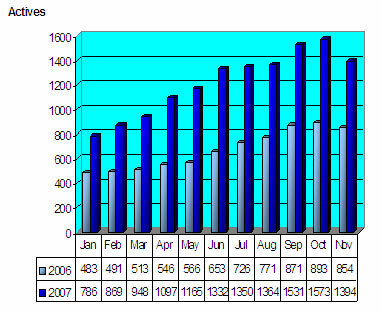 It is apparent that we have slowed down some, and with the mortgage industry under the gun, many people are hesitant. I truly don’t believe we are going to see 20% decreases in our market, and I agree that after the first quarter in 2008 we will be doing just fine. We are still seeing appreciation in many areas. Area 701 is doing great! Thanks for the great article! Yeah Kelly things are really going to be fine. Keep telling yourself that. The denial in Seattle is absolutely amazing. don’t be so gloomy. It is obvious that prices won’t appreciate a whole heck of a lot from here on out, but that doesn’t mean we all need to have “doom and gloom” attitudes. You write a good blog. You break the information out very well. 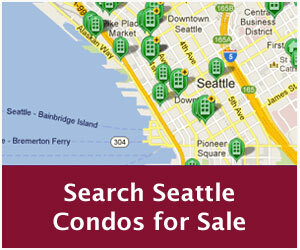 I have been tracking condos and noticed a decrease in inventory as well in Nov. Any ideas why? This bucked the recent trend. 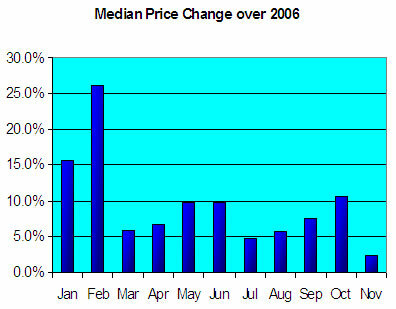 In my opinion, it’s mostly seasonal with sellers pulling their properties off the market until the new year. 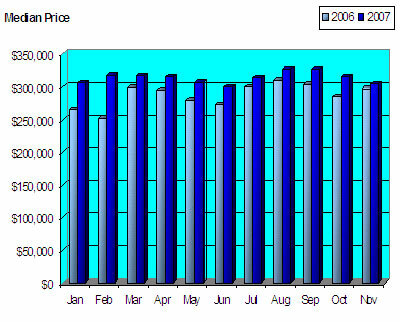 This is partly due to the holidays as well as sellers anticipating an upturn in the market in the Spring. Great presentation of data. By having these numbers it really does tell a more accurate story. Which is awesome, in this kind of market i feel its very vital to observe what the market is doing; we need to it rather than the so called ‘experts’. Reno’s condo market is not doing good either but lately I’ve noticed that the the condo market’s fall is getting is losing some speed compared to residential homes. Lower prices are not gloomy for many.